Yep! am happy to have lots of awards especially if there is a linky love and hmmm.. I will reveal it in later time, heheheh.. All for now is I love it! Who don't want such thoughtful words which I could think I am worthy of it too? *wink* Well, the most important is what the sender thinks of you as giving it and what it really implies why one gives it to you. Whatever it is, I am an optimistic person and am very much happy one gives me such. I just want to say that sometimes I could not post it immediately because of such sometimes there are lots of them and could not accommodate such time to post it all. And also sometimes I just want to keep it or not naming blogs or bloggers personally, just in general term. So, I let to be in "lump-sum" term so I can put all the sender in one post. The good thing is I will post all the bloggers name or blogs name to appreciate the giver. I know it's not easy to prepare it especially if there's a linky love that one thinks who deserves such so, the giver should really be appreciated of the work one made. Kudos to them! 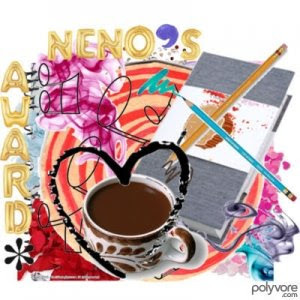 The above is a NENO'S AWARD which was given to me by Meryl and Te Eden. Thanks a lot dear friends of mine for including me to be one of your awardee for this beautiful award. * Don’t forget to mention the person who gives you the award. * Answer the award’s question by writing the reason why you love blogging. * Don’t forget to notify the award receivers and put their links in your post. Okey, the reasons why I love blogging is I can express my inner thoughts and to practice my writing skill. And I wanna give and pass this award heartily to all my blogging friends especially on my list of friends in my blog roll. Come on guys, join in!